Any good magician will tell you, the best tricks depend on misdirection. So while all eyes are on the spectacle of the House GOP's in-fighting, its search for a new Speaker and the never-ending "who-insulted-who" shenanigans of the GOP Presidential primary, it's easy to forget that Congress is now also quietly working on legislation that could impact virtually every American family, especially those that depend on Social Security, Medicare and Medicaid. The American people must not be distracted by the ongoing political show to the point that they miss the real action occurring behind the scenes. Before leaving for recess in December, Congress faces legislative deadlines to avoid a government shutdown, a default, an extension for transportation funding and tax breaks. While the shutdown has been narrowly averted, the annual appropriations process continues as the President and Congressional Democrats push GOP leaders for a deal to mitigate automatic across-the-board cuts to defense and non-defense programs - also known as the "sequester." No amount of political magic can hide the fact that three years of sequester caps have had serious consequences for important seniors programs, including the Older Americans Act and the Low Income Home Energy Assistance Program, along with service reductions at Social Security Administration field offices. That's why the National Committee supports the President's plan to increase spending caps. However, some conservatives in Congress insist that relief for programs like the Older Americans Act be paid for by cutting Medicare and Medicaid. This budgetary sleight-of-hand could trade partial relief for some seniors' programs by cutting other essential health security programs like Medicare and Medicaid, thus further eroding the tenuous economic situation many older Americans face. Ending the Medicaid joint federal/state financing partnership and replacing it with fixed dollar amount block grants, giving states less money than they would receive under current law. Repealing Medicaid expansion. Since 2014, states have had the option to receive federal funding to expand Medicaid coverage. Over half of the states have expanded their Medicaid programs, and others will likely do so in the future. Repealing this option would result in at least 14 million people losing their Medicaid coverage and state Medicaid programs would lose a total of900 billion over 10 years. Cutting Medicare by 431 billion over ten years. Over half of Medicare beneficiaries had incomes below 23,500 per year in 2013, and they are already paying 23 percent of their average Social Security check for Medicare cost-sharing in addition to out-of-pocket costs. The National Committee to Preserve Social Security & Medicare has prepared a detailed look at the many policy options in our Fall Budget Outlook brief. Legislation may need to be enacted by late November or early December to allow the government to continue borrowing and avoid a government default. Allowing a default would result in an economic catastrophe and jeopardize the payment of Social Security, Medicare and Medicaid benefits. In addition, default would jeopardize Medicare and Medicaid payments to doctors and hospitals and coverage for prescription drugs, which are critical to the health security of millions of Americans. As if all of this isn't enough, funding for the nation's roads and public transit will also expire at the end of October. Because the Highway Trust Fund no longer takes in enough gasoline tax revenue to cover surface transportation costs, Congress must come up with more funding. When Congress passed a temporary funding fix this summer, House leaders proposed using Social Security funds to pay for it. This was the third time in little over a year that Congress has attempted to use Social Security and/or Medicare as an ATM to pay for a completely unrelated priority. Last year Congress voted to extend the Medicare sequester cuts into 2024 to cover a reversal of cost-of-living cuts to veterans' pension benefits. This summer Medicare was cut again to help pay for the Trade bill. Rather than consider tax reform for huge corporate tax dodgers sending billions of profits oversee to avoid paying taxes, GOP leaders tried again (unsuccessfully this time) to cut benefits to seniors, people with disabilities and their families who depend on Social Security to pay for highways. Unfortunately, Congress could pull this outrageous strategy out of its hat once again. Need money for highways, to relieve sequester cuts, deficit reduction or anything at all? Voila! Let's take if from Social Security and Medicare. There's no doubt about it -- it will take more than legislative smoke and mirrors and political magic for Congress to get the job done right. But the American people also need to be more than an audience in this process. 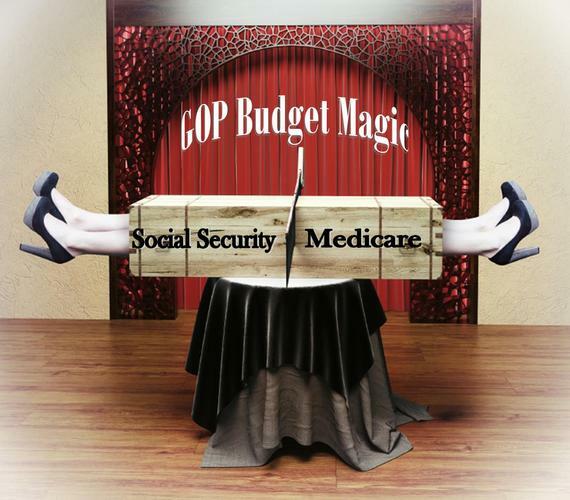 We need to pull back the curtain on this benefit cut agenda so the American people can avert any surprises Congressional leaders have up their sleeves for vital programs like Social Security, Medicare and Medicaid.